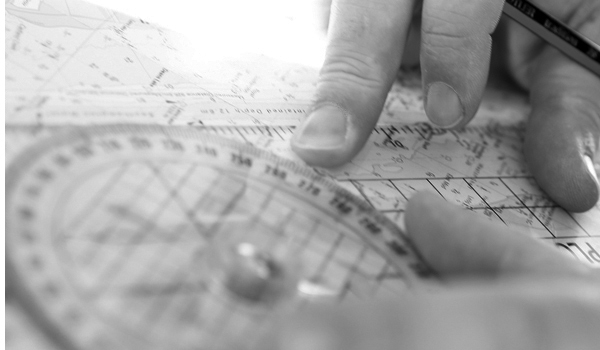 I’m sure most boaters or walkers or anyone who navigates their way around using charts or maps will have come across the situation where their compass is pointing one way and their maps or charts are pointing in a slightly different direction. The reason for this, in simple terms, is that the molten core of the earth, which is constantly moving, is what compasses point at. However, when you look at the globe from a human perspective, it has been drawn with the North Pole at the top and the South Pole at the bottom, a slightly skewed axis and to add insult to injury, the beautifully drawn land masses are not quite in the position that our trusty new GPS gadgetry now correctly indicates. Here’s an interesting observation to chew on; if you went out into space and looked at the world, how would you know which way is up? Is the North Pole actually at the top? Obviously, if we are to sail around without bumping into things we need to work out how to work on the same page as the compasses we are utilising. What we do, is allow for the difference in opinion (Variation) and once applied to the (True) or unadjusted heading, we end up with a (Magnetic) heading figure. The story doesn’t end there though. Stick a compass on a boat and all the electronic and magnetic forces on the boat will have a further effect on the compass, confusing the ‘poor dear’ even more, this we call (Deviation). Making an allowance for the Deviation inaccuracy of the compass gives us the most accurate heading and is called a (Compass) heading. Do not despair. When you buy a new boat, a compass adjuster will get on board and eradicate as much of the Deviation as possible. The bit that’s left will be listed on a compass Deviation card so you can allow for it when navigating. Beware though. If you change any electronic equipment, or bring items onto your boat that have any electronic or magnetic properties, they will have an effect on the compass and it will have to be ‘swung’ again! By now you must be starting to wonder how you’ve managed to navigate safely between ports without bumping into rocks and chunks of unexpected land. The answer, of course, is that we all readily use the chart-plotter/GPS equipment that’s become almost as intrinsic as the hull! The chance of this equipment failing is remote and I have touched on this in another tip but if it were to fail or cease to operate correctly we will have to deal with Variation and Deviation before we can start to steer a course by the boat’s compass. This is an example of a compass rose on a chart. The Magnetic Variation shown is 2 degrees, 45 minutes West, correct in 2006. Each year, this ‘error’ is decreasing by 8 minutes. There are 60 minutes in a degree, so for 2017 – 11 years on – that’s a reduction of 1 degree and 28 minutes. Therefore the Magnetic Variation in 2017 is 1 degree and 17 minutes West. Yes, there will come a point when the error disappears completely and then starts to become an East Magnetic Variation. When I first started teaching, the Variation in parts of the Med was just under 2 degrees West and the last I saw it was almost zero – Point & Go! N.B. Please remember, Magnetic Variation is nothing to do with whether you are going in a Westerly or Easterly direction, it is actually about your position on the globe relative to that molten core of the Earth which we spoke about earlier. The question now is, how do we know whether to add or subtract these degrees of Variation or Deviation? I don’t doubt that there are many different ‘aide memoirs’ but the one I favour, naturally, is the one I made up myself. If you are calculating from True (shown on the chart) to Compass (the heading you are going to steer to by the ship’s compass) then any Variation or Deviation you allow for that is West must be added. In other words True To Compass Add West – TTCAW. It therefore follows, that any Variation or Deviation that you encounter when going from True to Compass that is East must be subtracted; the opposite, see? Furthermore, when you are calculating from Compass to True, as you might when taking a Magnetic bearing with a hand-bearing compass, you would add East and subtract West. Clear as mud isn’t it? Have a look at the table below, which has some examples. Just to reiterate, don’t fall into the trap of thinking the direction you are pointing your boat in determines whether the Variation or Deviation is West or East. The Variation figure comes from the compass rose on your chart and the Deviation figure from your boat’s deviation card. To remember the order try, ‘True Virgins Make Dull Companions’. Alternatively, if that’s too racy for you, remember the reverse order with, ‘Cadbury’s Dairy Milk Very Tasty’.